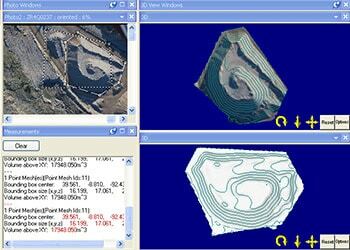 There are a number of applications in mining, quarrying and geology for PhotoModeler and PhotoModeler Premium. PhotoModeler Premium provides a very cost effective and efficient method for modeling the earth surface, cliff and exposed rock faces, stockpiles, and tailing piles. One can extract dense point grids (similar to a laser scanner). 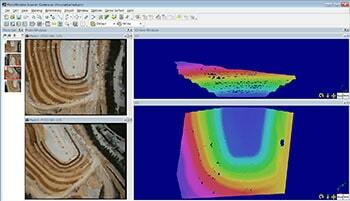 In addition surfaces, contour lines, and measurements can be done on the resulting point clouds. With input of external control data you can geo-reference the project and the outputs. Far more cost effective than using traditional surveying methods! Measuring volumes of stock and waste piles is a good application as well. This Volume Tip video shows how it is done. In addition look at the drone/uav applications page. Mike Dunn, author of Recent Developments in Close Range Photogrammetry (CRP) for Mining and Reclamation, writes, "The mining/reclamation community depends on accurate mapping for almost all activities. Traditional ground surveys are totally adequate for small, uncomplicated jobs but at some point, the size and/or complexity of a project makes it more economical to have a site “flown” (mapped using aerial photogrammetry). Because of cost, most projects are only “flown” at the start and less often when completed. Changes during the project may be surveyed but in many cases aren’t worth it –negative cost/benefit, too dangerous, or inaccessible. AML complaint investigators can face similar issues. For example, monitoring a nuisance landslip to decide whether it is a true emergency. Close Range Photogrammetry (CRP) offers much potential for measuring features that can’t or aren’t being measured otherwise." Mike Dunn's slides from his presentation can be found here (6.3MB pdf). This stockpile was photographed with a Canon EOS 1DS mark II and 50mm Leica lens from a Cesna 172 aeroplane at approx. 300 meters. It was a test of making volume measurement and it succeeded very well. This screen shot shows the stockpile's contours (on top of both shaded and textured models), as well as the volume above the ground plane in the software's Measure window. It was oriented with manual marking and referencing and then DSM processing for the point cloud and mesh. This animation depicts the shaded TIN model of the stockpile along with the computed contours. All generated in PhotoModeler Scanner from two aerial photos. 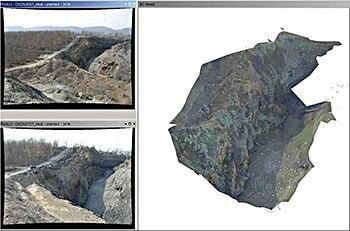 This 3D scan of an open pit mine in Galicia, Spain done with PhotoModeler Scanner, shows two colorized (by height) 3D views. The project was created by Ruben Pintor Fuentes, of Studo3D. While not a mining or geology example per se, this scan of a stream table to simulate erosion is related (and we don't have a geomorphology, erosion, or hydrology section in the website yet!). This shot shows two of the project photos on the left, and then a colorized 3d view (close up below) showing the dense point cloud. Color varies by depth. On the right is a surface model (of the bottom part of the stream bed side-lit to show the depth variations).